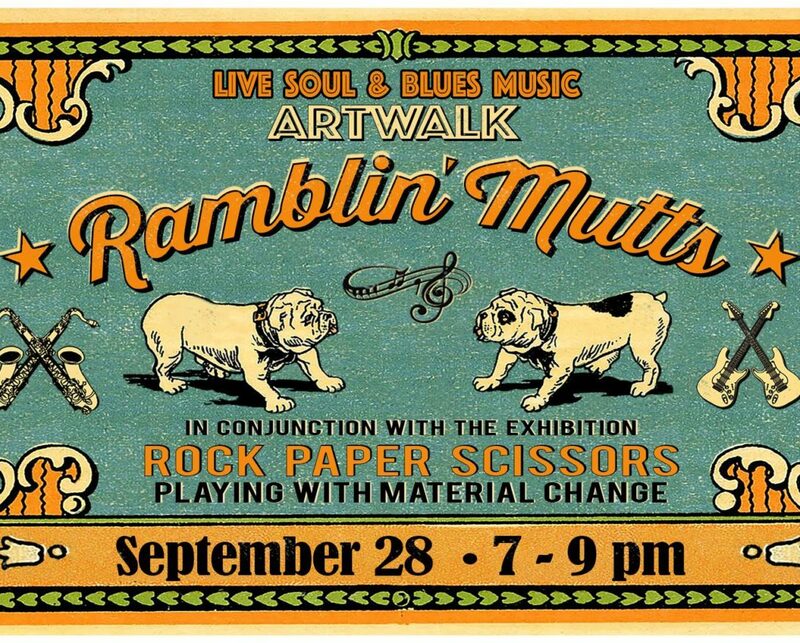 The Ramblin Mutts is, in case you were not aware, the new name for the R. Mutt Blues Band, two-time International Blues Challenge participants. As always, fronting the band is Dan Stepp on lead vocals, keyboards and slide guitar, and on lead guitar is Paul Goble. Filling out the rhythm section is Richard Heipp on bass, joined by the driving drum beats of Rich Patrick (also known from the bands Showtime and GruvTherapy). RockPaperScissors | Playing with Material Change is what happens when artists are inspired by the very materials they hold, stitch, carve, fold, print, cut, weave, or shape. Each piece in RockPaperScissors telegraphs a bit of creative obsession with tactile satisfaction  from the way pigment integrates with the fiber of cotton rag paper, to the touch of silk threads intertwining, to the cold smooth feel of alabaster as it is endlessly polished by the artists hand.